Youre right it is, but the main seal doesnt seal the oil pump, it seals the crank case against the balancer. Only pressure it sees is crankcase pressure. If you looked at the oil pump, it is completely sealed within the front cover, if youre getting oil pressure to that seal you have bigger issues. Y dose everyone think that? Plz look closely at the front cover before saying theres another problem. Ive been into about 100 of these engines i know exactly wat im talking about. A Grotor style pump uses a squish effect to pump a fluid. because slowbalt is correct. the pump gears seal to the body of the pump because of the tight tollerances, some oil will leak past, this keeps the gears from galling in the pump body. if a seal blowout happens its not because the oil pressure is too high, its because the pump body is worn and too much oil is going past the gears and putting oil pressure into the front cavity where the seal is. a lip seal is not designed to hold back much pressure, a plugged crankcase vent/pcv is enough to blow a front or rear main seal out. almost all automatic transmission (specifically rwd, fwd can differ) use the exact same thing, the torque converter snout drives the oil pump, exact same design. automatics can run anywhere from 150-300psi line pressure. ive dealt with a lot of front seal leaks in automatics, if they blow the front seal out you have to pay close attention to pump body weak, the condition of the pump gears, and for blockage in the drain back cavity from around the front seal. ive had cases where people re/re the transmission 3 or 4 times to replace the front seal and cant stop it from leaking, its cause the pump is bad. id be pulling the timing cover and inspecting the pump. take the cover off the pump and put a straight edge across it, use a feeler gauge, any more than .002" between the gear and straight edge, or between the side of the outer gear and the body and its junk. btw: my 2.2l runs around 90-100psi, never had an issue. Y dose everyone think that?. U guys have no idea. U pull the front seal the oil pump gears r right there. Also the car has 3 -12 lines to a catch can. To top it off it has a crank case pressure sensor which shows a small amount of vacuum from the evac system on the car. Yes we have no idea because weve never taken it apart and looked at it. its pretty easy to see man. Either the pump/cover are damaged, or the seal was dry when it was ran. I'm deferring to Trevor since he knows more about the inner workings than me, but I agree with Sharkey, my last motor ran 80-100psi all day. Soooo plz tell me how the front main seal dosnt see oil pressure wen the oil pump gears r directory behind it. The Grotor style pump that the ecotecs uses works off a squishing effect. Sooo with out a seal there the pump will push the oil right out. you obviously didnt read my post. the pump gears have tight clearance to the body, this lack of clearance is what seals the gears to the body and keeps the pressure in the pump. yes some oil leaks past, but not full oil pressure, at least thats how its designed to work. excessive wear will cause more pressure loss and can lead to the seal blowing out. I get wat ur saying man. After 10 years as a hydraulics tech for CAT im having a hard time seeing it. Since the gears r right behind the seal. I know exactly how it works and y. I also know wat ur talking about but that method dosnt apply to the ecotec oil pump the gears would need to be shiffted to the pressure side more. well as a cat hydraulic tech you should know that a lip seal thats pressed in would never stay in place if it was holding back full oil pressure of even a stock engine. Thats y there is a step on the pully to keep the seal from pushing out. Like the flywheel keeps the rear main from coming out. Now that i think of it i have a feeling the ATI might not have that step. Ill have to look. Cuz the seal was literally pushed out of the cover. As fun as it is to try to decipher what is being typed up about this oil pump I'm more curious about the suspension set up on this car. Foximus have you changed anything or revamped anything to go along with your new engine build? So in 2015 we were sorta sponsored by BC Racing. Got a set of their BR type coilovers with SWIFT race springs. At the end of '15 we were changing rates around to make it better, but I still wasn't happy. The BC deal fell apart, so I paid a local company, Feal Suspension, to rebuild and re-valve my BC's based on the corner weights of the car. Effectively they are one off Feal's for a Cobalt. Never really got a chance to use them last year since the motor blew on the first lap. We got the motor sorted out and making manageable oil pressure. working on some other aero parts in the shop, but sadly its looking like a lack of funding may keep us in he garage vs on track this year unless something changes. we have a couple irons in the fire for sponsor leads, but nothing secured yet. Motor is running fine, working on some aero... hopefully get the barge board plus fender panels finished this weekend. 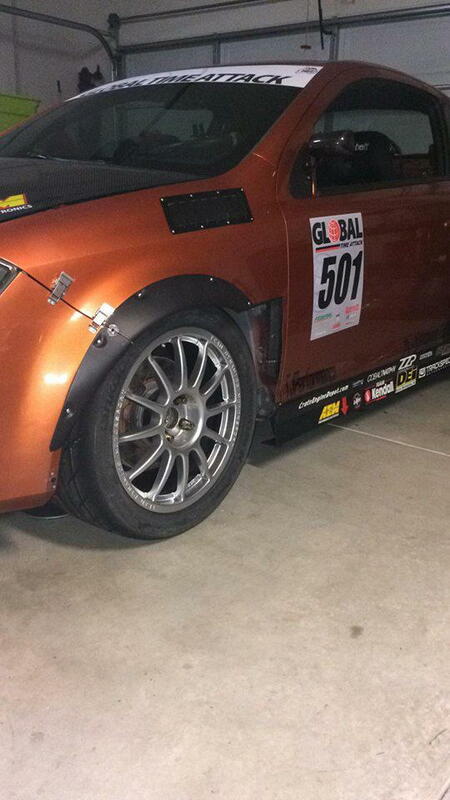 We will be at Global Time Attack Pro/Am Round 1 On Feb 25th for sure. Hoping that a solid enough run will help us find the money we need for tires + entry fees for round 2 in April. There's just some stuff that's happened this winter in my personal and work life that means I can't afford to go all out of pocket like we have in past years. foximus what kind of wheel and tire set up do you use on the track? You have any videos of the new setup up and running yet? First race of the season was yesterday. It went well, car had a few teething issues. We didnt catch that the hub on the blower is slightly misaligned.... belts dont like misalignment over 8k.